Australia’s table football players have united with the Dylan Tombides Foundation to raise awareness of testicular cancer in the lead up to the 2019 Australian Grand Prix of Table Football this month. 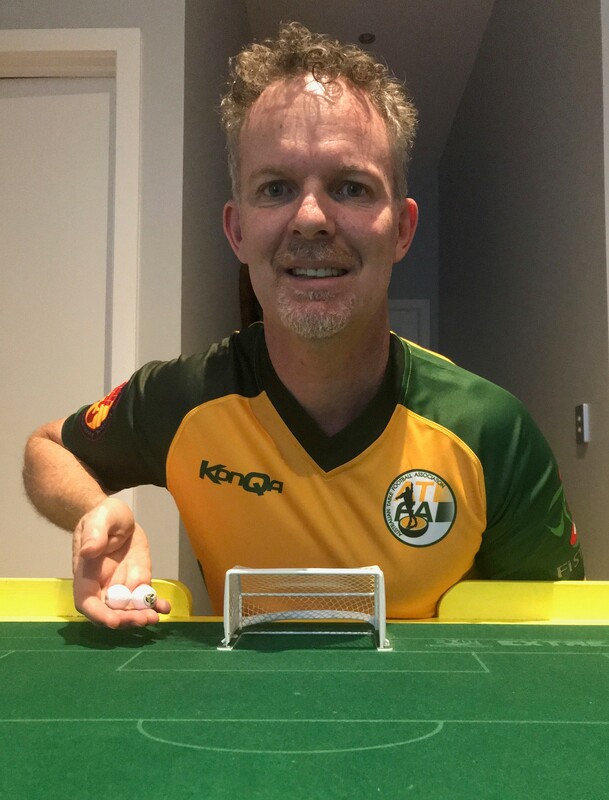 The cooperation is the result of Australian Table Football Association President Adrian Connolly’s personal brush with testicular cancer after being diagnosed just before Christmas. Like many men, Adrian says he knew very little about testicular cancer. The Australian Table Football community is uniting behind Adrian and have joined forces with DT38 Australia, a charity raising awareness of testicular cancer to save lives that was set up in memory of Dylan Tombides. 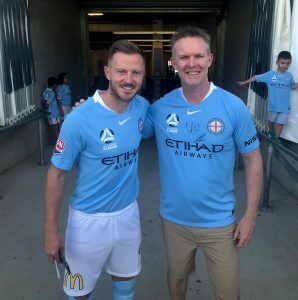 Dylan was an Australian International and West Ham United professional football player who passed away aged 20 in April 2014 after a 3 year battle with testicular cancer. The draw for the Australian Grand Prix tournament will be held on Friday 18th January and will feature special guest representatives of DT38 Australia. 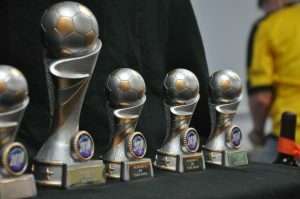 The tournament will take place 19-20th January. World no.25 Antonio Carabillo will be travelling from Hong Kong to take on the best Table Football players from across Australia. Testicular cancer is not a common cancer, but it is the most commonly diagnosed cancer after skin cancer in men aged 20–39. In Australia, about 850 men are diagnosed with testicular cancer each year, accounting for about 1% of all cancers in men. It occurs most often in men aged 25–40. ^1. 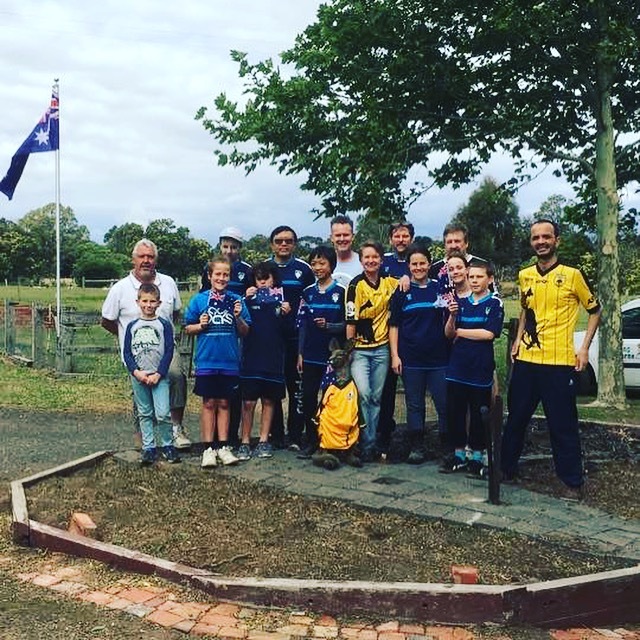 DT38 Australia is part of the DT38 Foundation which was set up in memory of Dylan James Tombides. Dylan was an Australian International and West Ham United professional football player who passed away aged 20 in April 2014 after a 3 year battle with testicular cancer. The West Ham Family thought so highly of Dylan that they retired his number 38 and made DT38 one of their principal charities. The charity has been formed as a result of Dylan being misdiagnosed. Their vision is to change the way testicular cancer is diagnosed by implementing best practice diagnostic guidelines for patients who present with testicular symptoms. DT38 also aim to arm future generations of young men with the necessary knowledge about testicular cancer that will enable them to be confident when taking health matters into their own hands. DT38’s mission is to raise awareness and change the stigma associated with men’s health issues with a focus on testicular cancer. They aim to do this through providing educational programs and opportunities for the youth of our community, to help shape a generation of children who are self- aware about their health and wellbeing. The Australian Table Football Association (ATFA) governs Sports Table Football which is based on the Subbuteo table top game that reached its peak in the 90s before making a retro comeback in recent years. 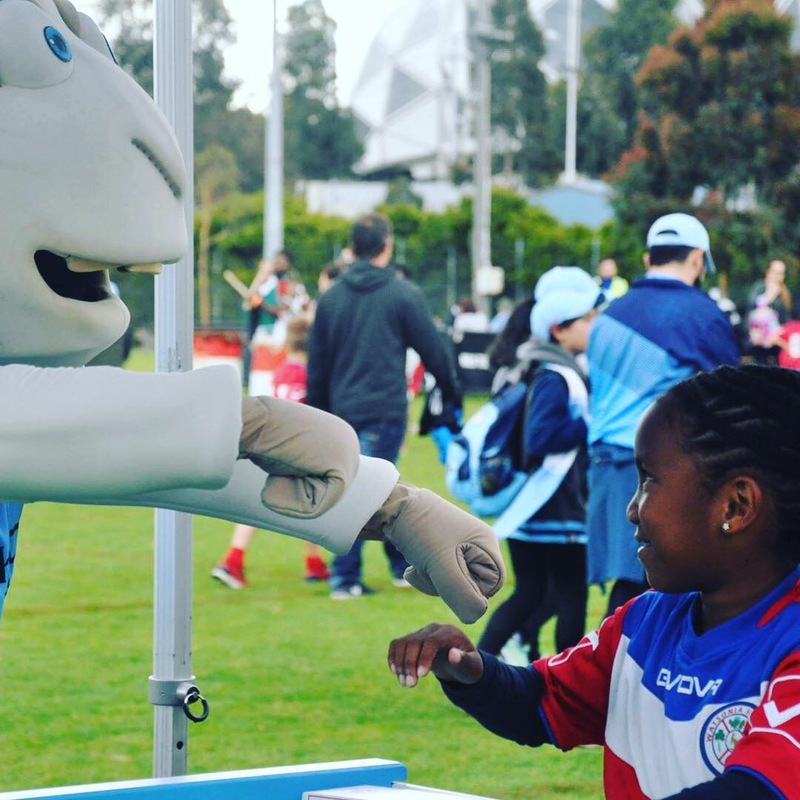 Clubs are located in each capital city plus major regional centres. 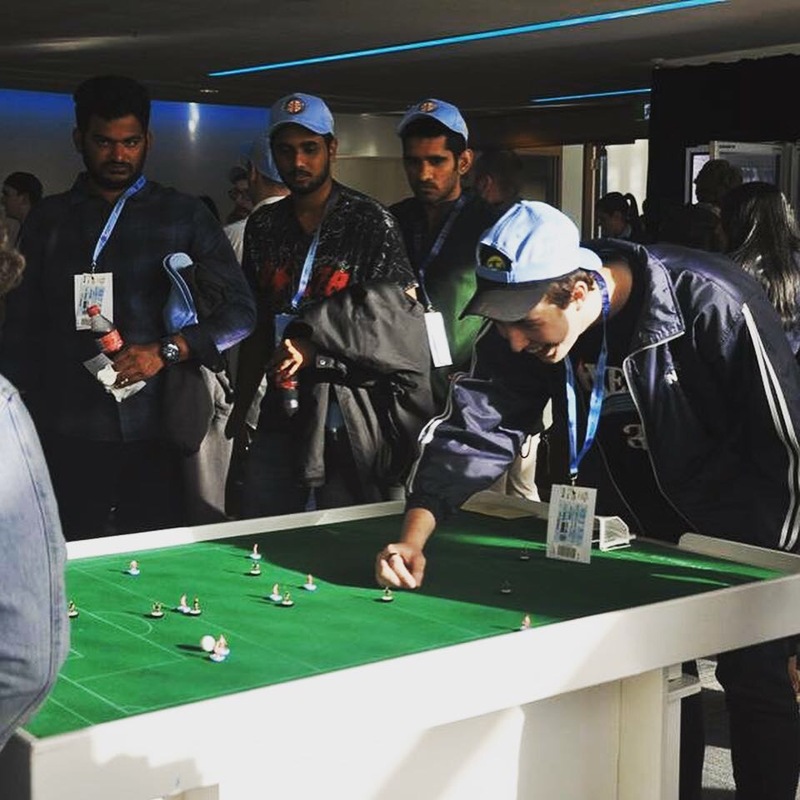 ATFA is a member of the world governing body for the sport, the Federation of International Sports Table Football (FISTF). The Australian Grand Prix of Table Football will be held 18-20 January 2019 at the Margaret Whitlam Recreation Centre in iconic Bondi, NSW. This entry was posted in News on 10/01/2019 by Subbuteo Australia. 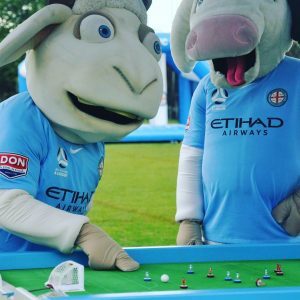 Victorian table football’s three clubs united to promote table football and support the Melbourne City FC pre-game entertainment prior to their A League clash with Newcastle Jets on Sunday 2nd December at AAMI Park. There was a touch of “table football’s coming home”. 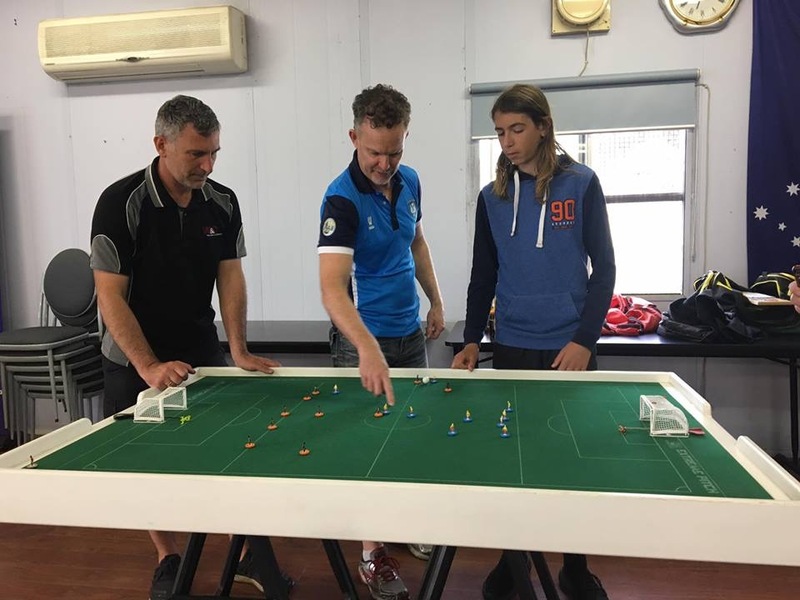 After all, it was through a fan forum for the then Melbourne Heart FC that current Melbourne Table Football Club (MTFC) President Luke Radziminski and former Australian Table Football Association President Benji Batten met. 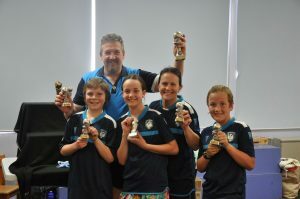 These two players founded MTFC and then played a key role in getting table football back on track in the state. 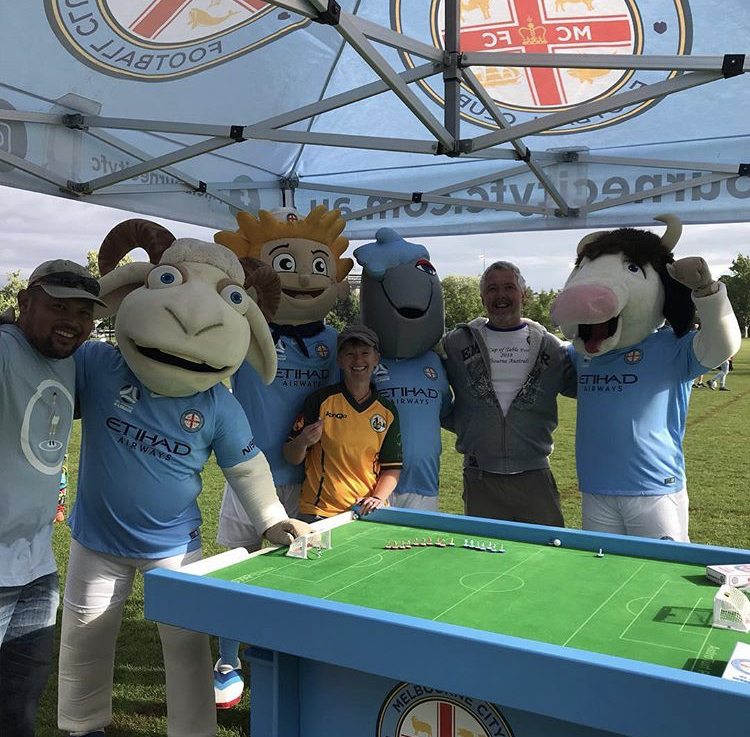 It was a great opportunity to showcase table football to the thousands of football fans in attendance thanks to Melbourne City FC. 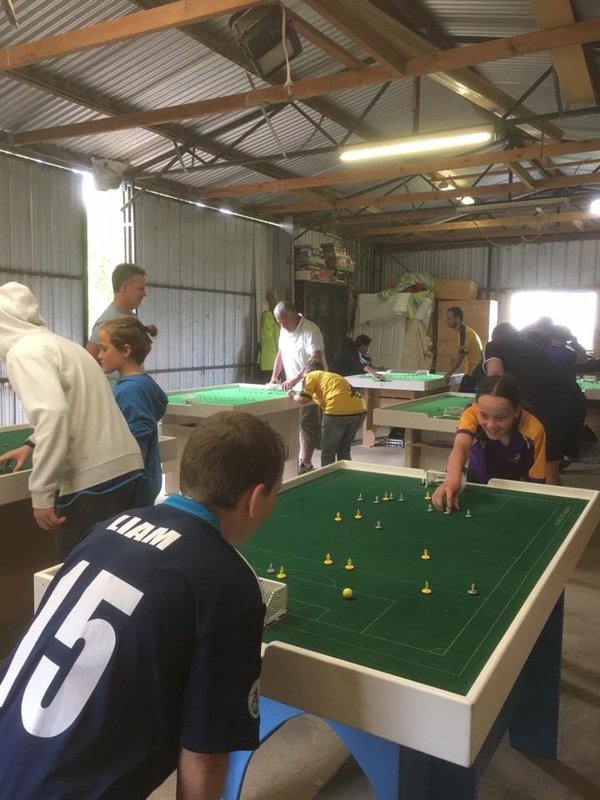 Many fans tried the game outside AAMI Park in City Square, both those new to table football and those that had seen or played the game before. It was fantastic to see people of all ages, male and female, eager to play. 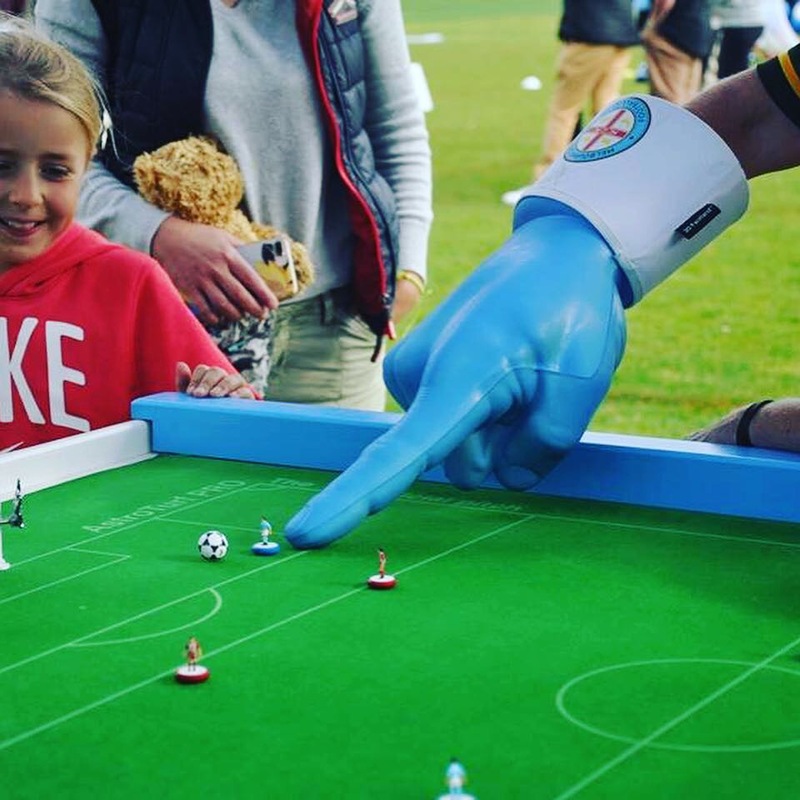 This is truly one of the great things about table football. Inside the venue, table football was also available in the VIP corporate room of McDonald’s. The McDonald’s workforce that were in attendance had fun trying their hand (or should that be finger!) 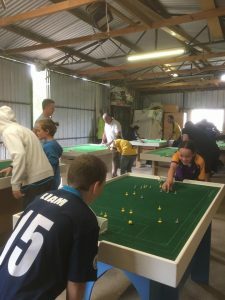 at table football both pre-game and during half-time. 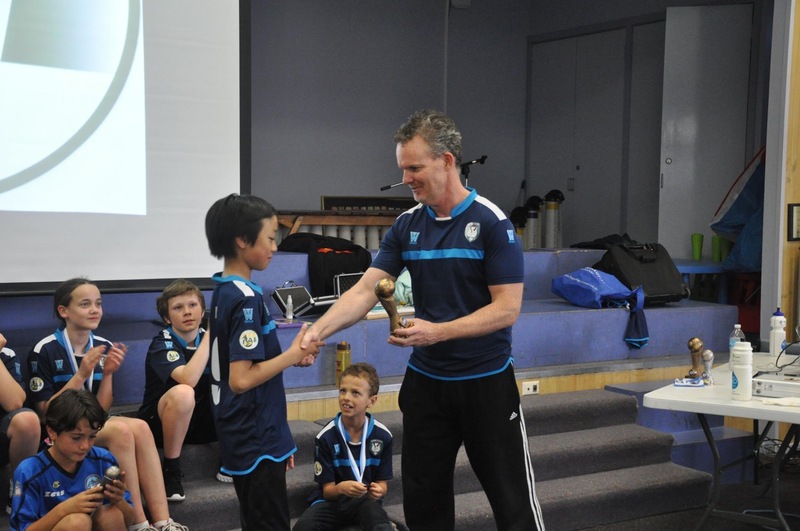 Dual AFL premiership player Leigh Colbert, present at the event, noted that his son was particularly keen on the game. He was one of many bitten by the table football bug! Hopefully this was the start of ongoing involvement between table football and Melbourne City FC. 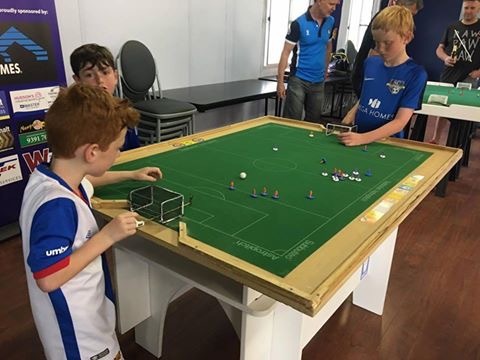 With this on the back of similar activity held by Brisbane Subbuteo Club prior to a Brisbane Roar A League game, and the planned Perth Subbuteo Club’s involvement with Perth Glory pre-game, it is great to see involvement between table football clubs and Hyundai A League clubs. 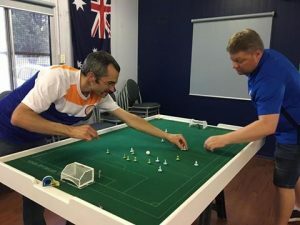 Exciting times for Australian Table Football! 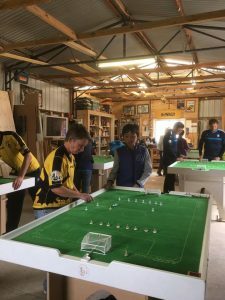 This entry was posted in News on 05/12/2018 by Subbuteo Australia. 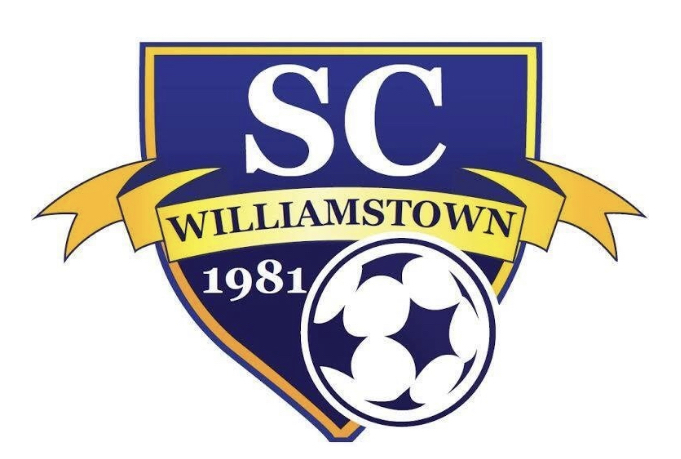 A great start for Western Flickers TFC at their new clubhouse thanks to Williamstown Soccer Club. Plenty of keen participants, most seeing the game for the first time. Also great to see Canberra TFC’s Ryan Farrall come along whilst down in Melbourne. 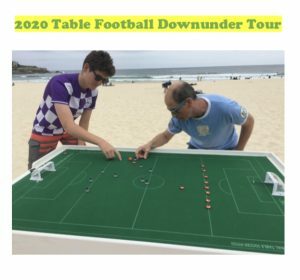 This entry was posted in News on 21/11/2018 by Subbuteo Australia. After consulting with Australian-based Table Football players via an online survey, the Board of the Australian Table Football Association (ATFA) has produced a Vision Statement to focus on what we aspire for Table Football in Australia to become by 2023 in our key focus areas of Growth, Community and Excellence. 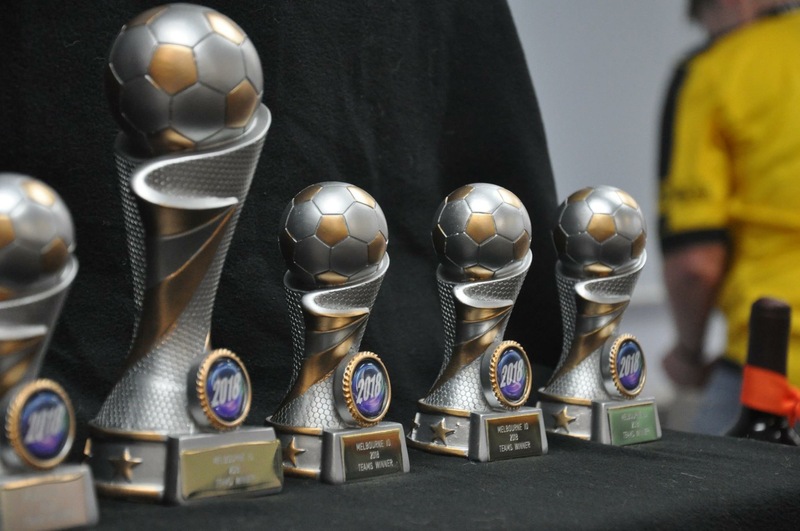 Vision 2023 is available from the Documents section of the ATFA website where you can also find other useful information such as the ATFA Code of Conduct, Constitution and information for tournament organisers. This entry was posted in News on 11/11/2018 by Subbuteo Australia. 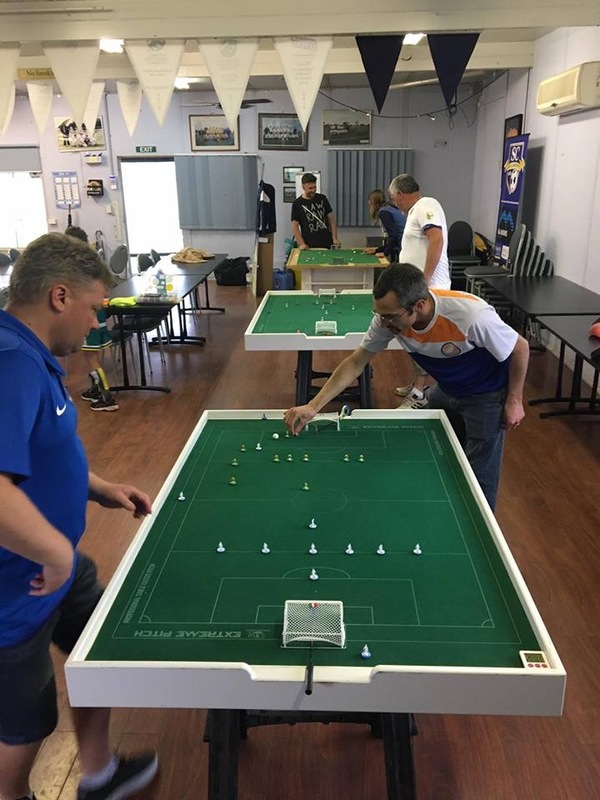 The Western Flickers Table Football Club are pleased to announce that a “Come and Try” Table Football exhibition will be run on Tuesday 20th November from 6pm at the Williamstown Soccer Club, JT Gray Reserve, Kororoit Creek Rd, Williamstown, VIC 3016. Everyone is welcome to come along, find out about this version of football (soccer) and have a go! 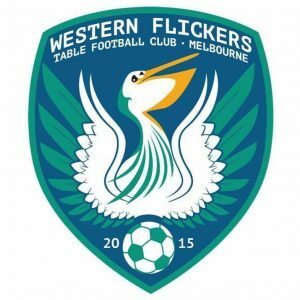 Western Flickers Table Football Club, based in Melbourne’s western suburbs and originating in Hobson Bay, are excited by the possibility of this being the start of a long term affiliation with Williamstown SC. In addition to Williamstown SC being a local soccer club in the Hobson Bay area, they share many of the same values as demonstrated by the growth of this community focussed soccer club that now has over 30 teams to cater for all ages, both genders, and all abilities. This entry was posted in News on 04/11/2018 by Subbuteo Australia. The women’s event kicked off the weekends’ festivities. 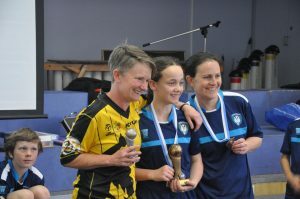 It was contested between Beth Eveleigh of the Northern Pheonix and two Western Flickers TFC Members – Juliette Browne and Charlotte Wright. A tightly contested round robin league ensued. Beth drew both her games 0-0, meaning that Charlotte’s 1-0 win over Juliette in the final game decided the proceedings. Charlotte took out her first FISTF title, with Beth runner up, and Juliette third. The junior event was contested by 8 players in two groups of four. The top two from each group progressing to the FISTF IO semi finals. Benjamin Ng and top seed Gabriel Lombard early on showed they were the players to beat in this competition and took out their respective groups. Charlotte Wright backed up her win in the Women’s event with a strong showing to progress from her group to the semi finals and defeating the vastly improved Aidan Deverell in the 3rd /4th playoff. In the final, Gabriel played some quality Table Football but it was the killer instinct in front of goal that proved the difference with Benjamin Ng winning the Junior title 3-0. 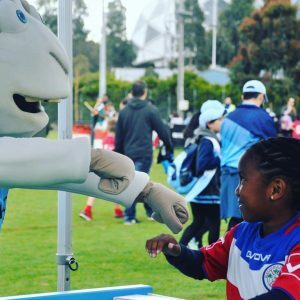 The junior WASPA was held for all those eliminated from the FISTF event. 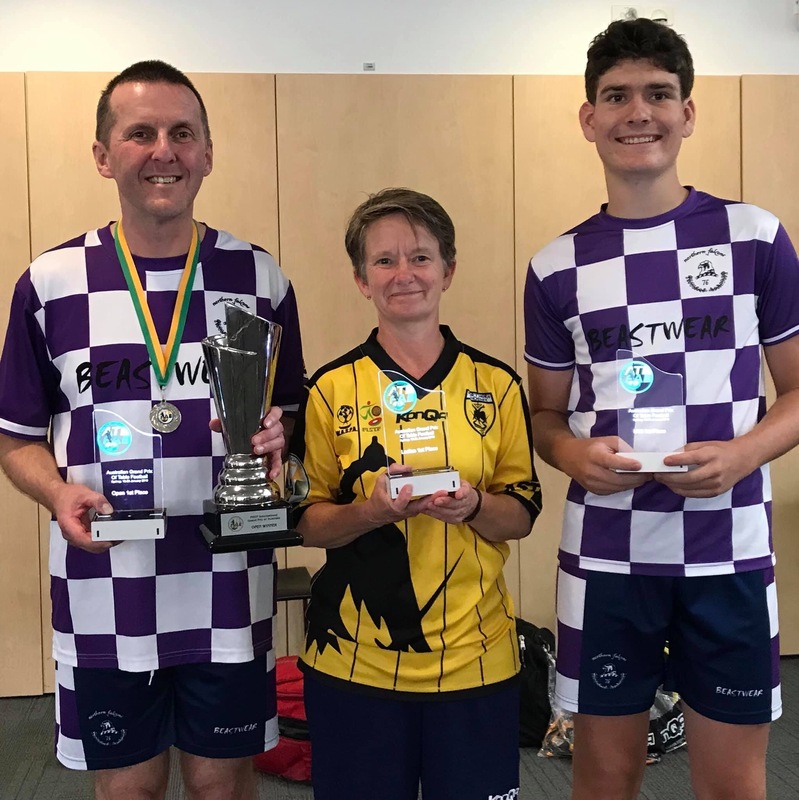 Second seed for the FISTF Junior competition, Billy Wright, overcame his disappointment at elimination from the main event to make the final but didn’t join his sister on the winners’ list, going down on penalties to promising debutant Liam Browne in the Junior WASPA final. – 1. 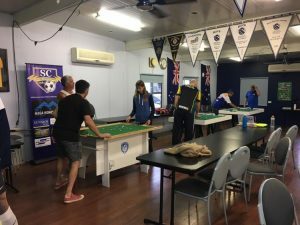 Players not occupied referreeing the Junior, Women’s or Teams events on the Saturday were free to organise themselves games on the spare tables and record results. – 2. The final standings were made using the new Power Rankings system given that not all players played a similar number of games, or games against players of the same standard. Only results on the day counted. A win over a player who had performed well on the day was worth more than a win against a player who was winless. – 3. All enquires on how Power Rankings are calculated should be directed to Richard Wilson. – 4. For disputes on the outcome, see rule 3 ! 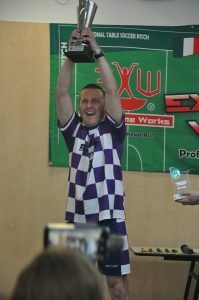 The completion was narrowly taken out by Raffaele Lombard from Eliot Kennedy and Giuseppe Tardiota in a good indicator of players to watch in the main Open event on Sunday. 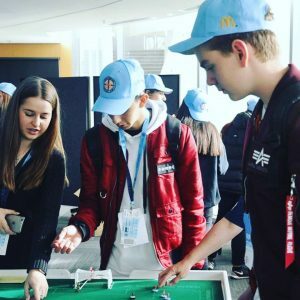 Sixteen players competed in the Melbourne IO. Top seed Raffaele Lombard and third seed Eliot Kennedy would have been more pleased with the draw than second seed Benny Ng or fourth seed Steve Dettre, and it would turn out to be the case. In Groups 1 and 3 Raffaele and Eliot cruised though their group games, with Eliot particularly impressed with three 5-0 victories. Steve Wright progressed in second place in Group 1 on goal difference with his final round win over Juliette, whilst Kevin Grant went through in second place from Group 3 by defeating the 2018 Melbourne IO Junior Champion Benjamin Ng in the contest of that group. Groups 2 and 4 were both wide open going into the final round of fixtures. Second seed Benny Ng was at risk of not progressing after letting a 1-0 lead slip against Giuseppe Tardiota to go down 1-2. Benny needed to defeat Luke Radziminski or hope his club mate Charlotte Wright could do him a favour in the final round of group games. In the end Luke and Giuseppe got the results they needed to progress, with Luke topping the Group. Prior to the event, several good judges saw Luke as a dark horse to take out the title and by topping this “Group of Death” this appeared to be the case. 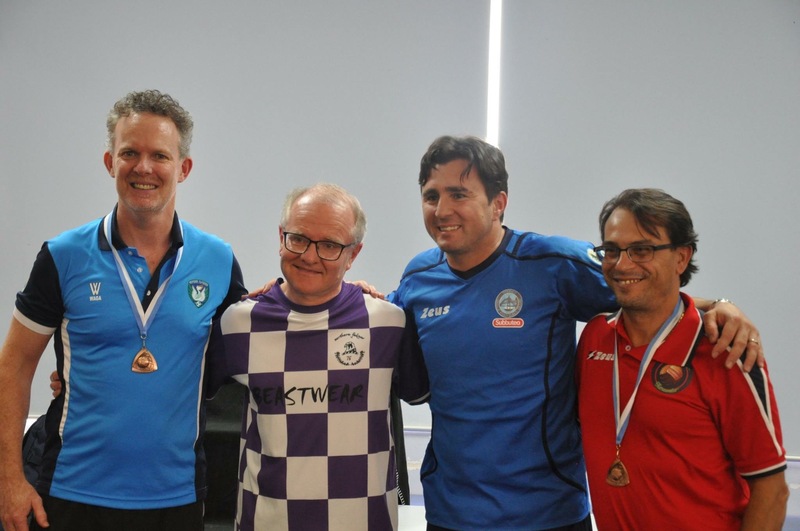 Group 4, the “Presidential Group”, pitted fourth seed FISTF President Steve Dettre, ATFA and Western Flickers TFC President Adrian Connolly, Northern Pheonix President Christos Garagounis, and Adam Deverell. 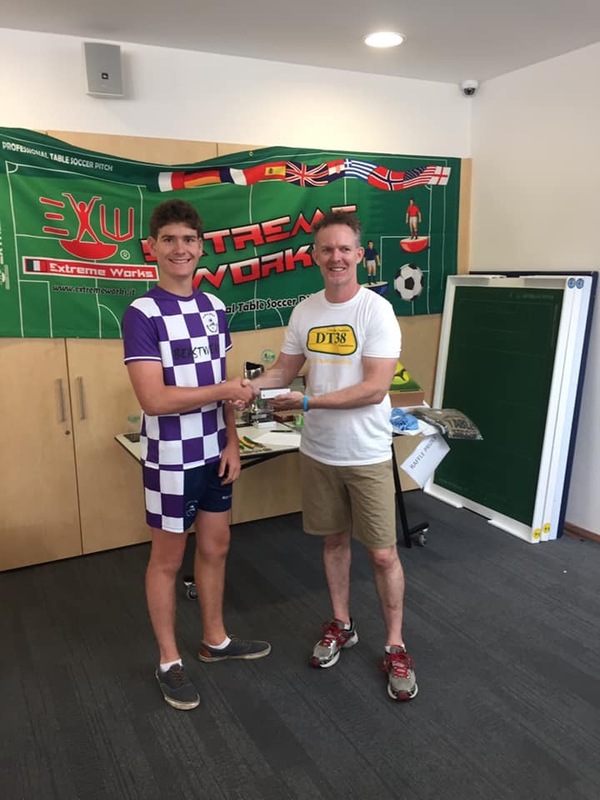 Adrian put himself in a good position to progress with a 1-0 win over Adam thanks to a goal in the dying seconds of their first round clash, whilst Steve took the pole position expected of the seed going into the final round thanks to a big win over the luckless Adam. 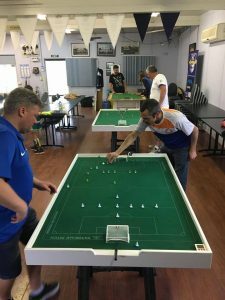 Christos drew his clashes with Steve and Adrian and as such needed a win in his final game against Adam, possibly by two goals, to progress. However, it was not to be with Adam doing his club President Adrian a favour by defeating Christos. The clash to decide the group winner was one of the games of the event. Steve took the lead early, but Adrian responded immediately with a goal from the kick off possession and then scored a second goal soon after to take a 2-1 lead. However, with seconds remaining, Steve drew level with the final action of the first half to tie it up at 2-2. The second half was much tighter. Ultimately a relentless sequence of corners by Steve Dettre creates the decisive opening for the third and winning goal that saw Steve take out the Group. 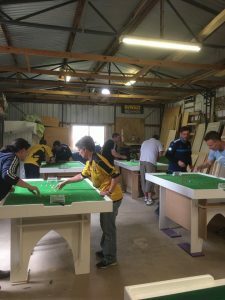 The quarter finals pitted Raffaele against Kevin; Eliot against Steve Wright, Steve Dettre against Giuseppe Tardiota, and Luke Radziminski against Adrian Connolly. The first two games went comfortably I the in form seeds Raffaele and Eliot. 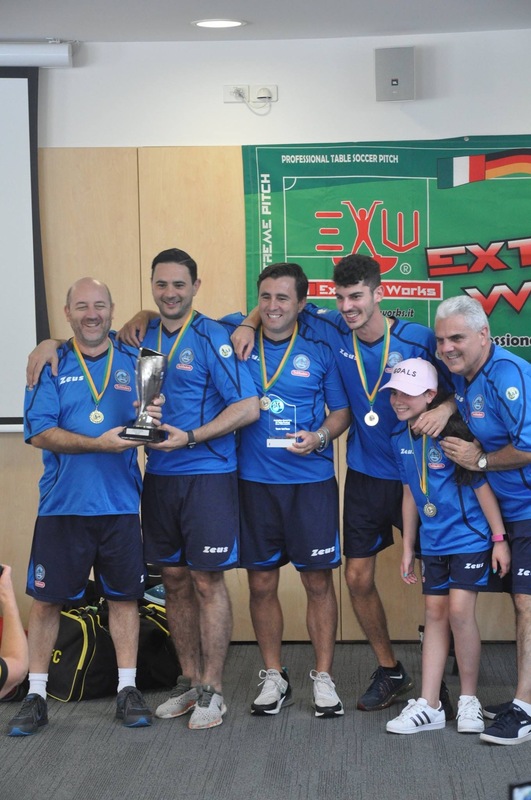 However, in the other games Giuseppe showed his improvement from his time in Italy to overcome Steve Dettre; whilst Adrian Connolly caused an upset by defeating Luke Radziminski 3-1. This meant 2nd in Group 2 had eliminated 1st in Group 4, whilst 2nd in Group 4 had eliminated 1st in Group 2. Given both Giuseppe and Adrian only progressed at all from their groups by virtue of results in their final group games this demonstrated how tightly contested this half of the draw was. The semi finals therefore featured players from each of the three states competing – NSW, Queensland and Victoria. 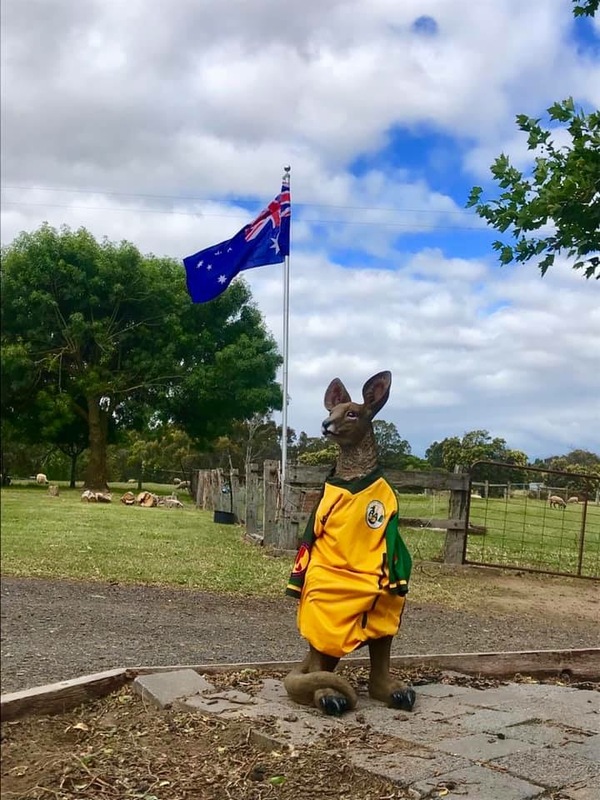 Given Adrian’s Tasmanian origins and his decade living in WA it could be argued that the semis truly had a National feel. In the first semi final Raffaele extended his run to 5 games without conceding a goal to go through to the final with a 2-0 win. Whilst in the other clash Eliot capitalised on some defensive blocking errors to take a commanding 3-0 half time. In the second half Adrian became the first player to put one last Eliot’s keeper. A gripping end could have been set up had Adrian taken a good chance with a minute to go, but a good save by Eliot saw him also comfortably progress to the final 3-1. The final was therefore contest between two of the travelling contingent from NSW. The high quality game was streamed live in high definition with the latest technology – timber, rubber bands and an iPhone! Eliot took an early lead but the top seed Raffaele responded well to equalise and then take the lead. Eliot found the net a second time with a great finish prior to half time but unfortunately the goal was ruled out in what later found to be an error by the referee. Eliot as always showed why he is such a respected player with the way he handled the decision. The second half saw Eliot needing to chase the game and in the last minute he had a good chance to score but sent his shot narrowly wide. Raffaele then attacked and scored a third goal in what would be the last action of the contest. 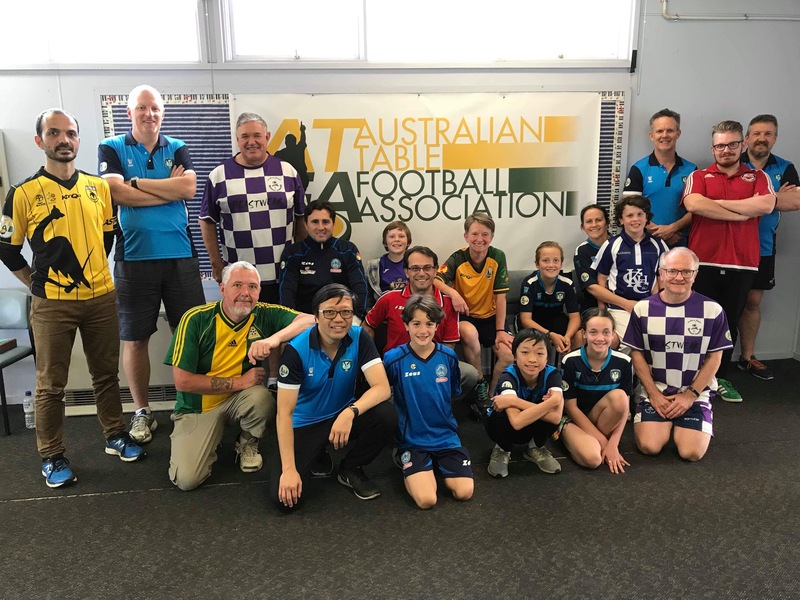 To ensure the WASPA was complete prior to the FISTF IO Final, the format was a straight knockout competition with 2x10min halves and penalties (no extra time). There were 9 competitors in the WASPA Plate Event, with the previous days’ junior runner up Gabriel Lombard joining the 8 players eliminated from the FISTF Open event. Gabriel played Charlotte Wright in the barrage. After a scoreless draw Charlotte won 2-1 on penalties to move into the quarter finals. 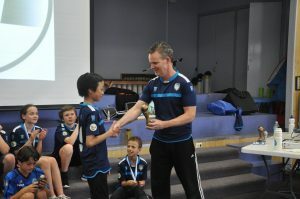 In the quarter finals, Charlotte continued her impressive run of results by defeating Adam Deverell 2-1 on penalties. 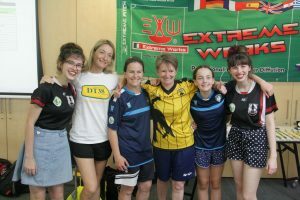 This set up a semi final showdown with her brother Billy who progressed after Beth Eveleigh needed to forfeit due to illness. Benny Ng accounted for Christos Garagounis to set up a clash with his son Benjamin in the other semi final after Benjamin defeated Juliette 1-0. In the battle of the Wrights, it was Billy that prevailed 2-1 on penalties after a scoreless draw. In the other semi Benjamin continued his run of wins over his father to progress to the final 3-1. Benjamin Ng, proved to strong for the WASPA Junior IO winner Billy Wright. Thank you to all the travelling contingent from interstate who added so much to the atmosphere and the quality of play. Steve Wright for managing the budget, registrations, payments. Kevin Grant for all the hard work moving the boards to the site (the boards of which he of course has made himself!) as well as his ingenuous “camera stand” for the live stream. Beth Eveleigh for again running the best raffle! Great prizes and a great little fundraiser to help with costs to keep fees down. Adam Deverell for the BBQ. Benny Ng as tournament head referee. NP TFC for the WASPA Plate Event. 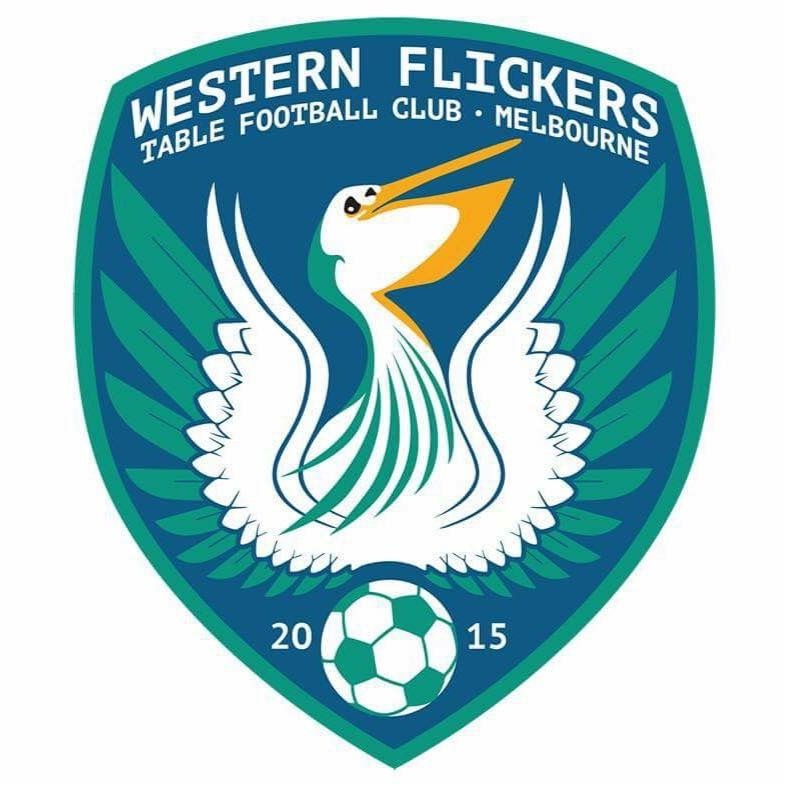 MTFC for use of their umbrella for the WASPA on Saturday. All players for stepping into their referee duties when asked, including the visiting Carl Young who walked in to watch at the wrong time when we were one short! Paul Mercer for his great tournament template to record the results and run the event. 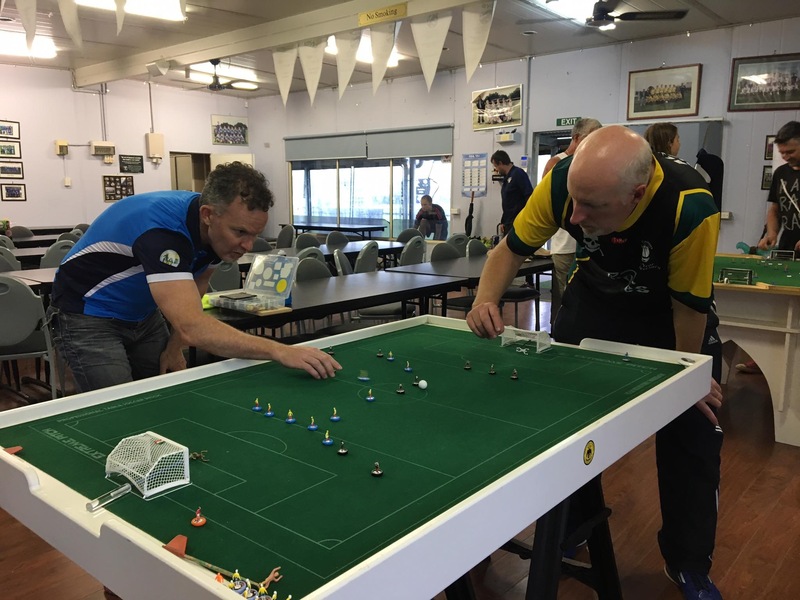 This entry was posted in News, Tournament reports on 25/10/2018 by Subbuteo Australia.